By now you've heard the news. Mas Selamat is on the loose. The terrorist had previously hatched plots to attack Changi Airport, the US Embassy, the American Club and the Singapore American School. He had been held under detention, at the Whitley Detention Centre. On Wednesday afternoon, he escaped when the guard(s) permitted him to use the toilet. This man walks with a limp in his left leg. Call the police immediately if you see him. 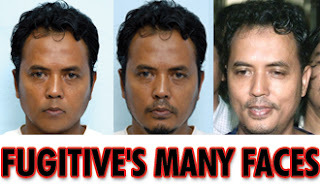 I urge all bloggers out there to immediately post Mas Selamat's face on their blogs. So that as many people in Singapore as possible will know, and be reminded of what Mas Selamat's face looks like. It is a very disappointing day for me, to realise how inept and useless the Singapore government has become. To think that we pay the world's highest ministerial salaries to our political leaders. Wong Kan Seng is paid two million dollars per year and he cannot even keep an arrested man under proper lock and key. A terrorist has escaped, for goodness sakes. I think Wong Kan Seng should resign. Terrorism knows no borders, and Wong Kan Seng's mistake potentially endangers the lives of hundreds, perhaps thousands, of people - not just in Singapore, but in other countries as well. All over the world, elected politicians have been pressed to resign, for much less serious matters. Okay, that was just some wishful thinking on my part. We know how Singapore works, don't we? It's just another "honest mistake" by our beloved ministers. 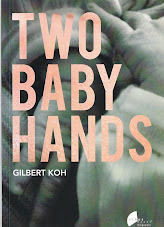 Lee Kuan Yew will twist and pull Wong Kan Seng's ears in private, I'm sure. But publicly, at least, Wong Kan Seng will ultimately walk away scot-free. ... as to why our ministers are really still world-class, and deserve their world-class salaries, and the Mas Selamat matter was all just a very honest mistake, and the important thing is that we learn from our mistakes, and not repeat them, (at least not until the next time we make a new honest mistake), and till then, the people of Singapore must be socially cohesive, and be strong, and support their government, as one nation. You know, the usual crap. Mas Selamat has managed to run away. But in the end, it will be Wong Kan Seng who makes the really Great Escape. The Government Missed By $7,150,000,000. Just Another Honest Mistake. The Straits Times reported a shocking piece of news yesterday. The article itself did not really highlight the point, but tucked it away somewhere near the end of the article (see bold text below). RISING costs and their impact on people's ability to make ends meet dominated the start of this year's parliamentary debate on the Government's Budget. Many of the 19 MPs who spoke during the five-hour session praised the Budget for being forward-looking and generous, but 13 also voiced concern over a slew of recent price hikes. MPs from the People's Action Party, Mr Inderjit Singh and Mr Michael Palmer, recited a litany of these increases in the past year alone. MPs said that businesses have been hard hit by steep hikes in office rents, and asked for tax reliefs to help them cope. For individuals, Mr Palmer suggested that part of the Budget surplus of $6.45 billion be used to set up a contingency fund to help low-income families should inflation worsen. Mr Singh, who chairs the Government Parliamentary Committee for Finance and Trade and Industry, urged a review of the Government's avowed strategy to grow the economy as fast as possible in good years. This had contributed to the current situation of overheating and high prices, he said. 'The 'grow-at-all-costs' policy, with the cost increases triggered or allowed by the Government, have worsened the income divide,' he said. At the same time, MPs threw their support behind the Government's five strategies to keep inflation in check. These include allowing a gradual appreciation of the Singapore dollar to rein in imported inflation, and growing the economy so that wages for most workers go up by more than costs. Nominated MP Cham Hui Fong of the National Trades Union Congress pointed out that last year had indeed been a good year for workers. Those in the unionised sector enjoyed the highest bonuses since 1990 and the lowest retrenchment rate since 1994, she said. But fellow NMP Eunice Olsen stressed that in tackling inflation, 'preaching' to Singaporeans to buy cheaper house brands was not a solution, as many people were already buying the lowest-priced options available. Four MPs - Workers' Party chief Low Thia Khiang, NMPs Gautam Banerjee and Ms Olsen, and Mr Singh - took issue with the wide gap between the Government's projected $0.7 billion deficit and the actual $6.45 billion surplus. This showed that the Government's 'Budget marksmanship' had worsened, said Ms Olsen. The four MPs also questioned whether the Government had been hasty in raising the Goods and Services Tax (GST) from 5 per cent to 7 per cent last July, since it did not really need the revenue it generated. Both Mr Low and Mr Banerjee asked for the GST to be restored to 5 per cent. But Senior Parliamentary Secretary for the Environment and Water Resources Amy Khor warned against assuming that the economy would prosper and produce a surplus every year. More than 20 MPs are expected to speak when the debate resumes today. So early last year, the Government had projected a budget deficit of $0.7 billion. This means that according to the Government's own estimates, in 2007 it would collect $0.7 billion (via taxes etc) less than what it would actually need to spend. It turns out that the Government scored a massive miss. In 2007, instead of collecting $0.7 billion less than it needed, the Government collected $6.45 billion more than it needed. From who? You, the people. Of course. Among other things, it becomes quite evident that the GST need not have been raised in July last year. "We started the year expecting a growth rate of 4.5% to 6.5%, which was also in line with market forecasts. With actual growth at 7.7%, Corporate and Personal Income Taxes came in some $1.0 billion higher than projected. GST revenues also exceeded our projection by about $1.2 billion, mostly from higher consumption. GST collection arising from the 2 percentage point hike in July is estimated at about $1.4 billion in total, which now just matches the size of the GST Offset Package and Workfare Income Supplement tranches that were distributed in FY2007. However, the largest boost to revenues came from the exceptionally buoyant property market last year. Prices of private residential units rose by over 30%, much higher than industry forecasts of around 10% to 15% at the beginning of the year. The volume of property transactions went up by over 60%. Stamp duties consequently rose to an unprecedented $3.8 billion, $2.3 billion higher than expected. Other property related revenues were around $1.1 billion above projections. These were large gains, out of the ordinary, and which we cannot expect to see very often. The overall budget surplus of $6.4 billion was therefore the result of a strong economy and property market." (3) Singaporeans spent an unexpectedly large amount of money, leading to an unexpectedly large increase in GST collection. By this time, you will conclude that the Singapore government is unexpectedly stupid at managing its own money and making its own financial estimates. Either that, or you are a very kind person, and always willing to give the benefit of the doubt, and you will say that indeed, the property boom and rapid economic growth in 2007 could not reasonably have been foreseen. But wait, I have more to say. Tharman has told you that in 2007, the Government collected much more money than projected, for B10, B50 and B70. But there's something interesting which Tharman conveniently didn't tell you. The Government had over-collected money, not just for B10, B50 and B70. But for every single category of taxes, from B10 to B90. Now how could the Government be so completely off the mark? (1) The Singapore government is unexpectedly stupid at managing its own money and making its financial estimates. (2) In early 2007, it was the deliberate intention of the Singapore government to make low projections for its revenue, so that it could publicly claim that there would be a budget deficit of $0.7 billion. Therefore more Singaporeans would be willing to believe that the 2% GST hike in July 2007 was necessary. SYDNEY - AUSTRALIA'S new immigration minister surprised a senate committee by saying he had too much power and was uncomfortable 'playing God' with people's lives. Mr Chris Evans' statement on Tuesday came after a series of scandals over the treatment of migrants by the conservative government of former prime minister John Howard, ousted by the centre-left Labor Party in November elections. Mr Evans said there had been a big increase in ministerial intervention in individual migration cases during the Howard government and in some cases people had no right to appeal. 'I have formed the view that I have too much power,' he told the senate's legal and constitutional affairs committee. 'The (migration) act is unlike any other act I've seen in terms of the power given to the minister to make decisions about individual cases. Mr Evans' predecessor last year controversially used his powers to revoke the visa of Indian doctor Mohamed Haneef and force him to leave the country even after a terrorism charge against him was dropped. Mr Evans said he was considering an ombudsman's report that called for reforms to ministerial powers, including his ability to revoke the visas of long-term permanent residents. I wonder how many people in Singapore still remember ex-SIA pilot Ryan Goh. Back in 2003, SIA pilots were very unhappy about their salaries and they had some disputes with their union over how the issue was being handled. Ryan was apparently one of the SIA pilots who played an active role in the whole episode. Up till then, Ryan had lived in Singapore for 26 years. He was married and had four children. He was a permanent resident. Lee Kuan Yew promptly kicked him out of Singapore, more or less overnight. The Singapore authorities suddenly declared Ryan Goh an “undesirable resident”, and his PR status was revoked. Well, I guess that’s one good thing about being a Singapore citizen. They can’t boot you out of the country just like that. (Of course, they can always still lock you away on Sentosa. Maybe for the next 32 years or so). THE Education Ministry (MOE) may have to consider court action against some parents who have refused to send their children to school. The six children involved have stopped school for some time, or only show up for classes from time to time despite extensive counselling and mediation. If the ministry presses charges, it will be the first time it is doing so under the Compulsory Education Act, which was implemented in 2003. The Act stipulates that anyone who fails to ensure that his child attends school shall be guilty of an offence. If convicted, the person may be fined up to $5,000 or jailed up to a year, or both. The authorities say they may have to consider using 'penal sanctions' because of the parents' poor response to counselling efforts by the schools involved and the Singapore Children's Society, a charity engaged by the ministry to counsel parents who do not enrol their children for Primary 1 classes. In some cases, social workers have been trying to change the parents' minds for the last three years, but have come up empty. When contacted by The Straits Times, the Children's Society said it was not authorised to give more details about the six cases. They come from dysfunctional families. They have indifferent or lax parents. They also may be influenced by older siblings who are school dropouts. Opinion was divided on whether charging the parents would solve the problem or make matters worse. What kind of parents wouldn't send their children to primary school? Many kinds, actually. Let's see. Daddy could be dead, in jail, schizophrenic or completely broke. Mummy could be suicidal, alcoholic, disabled or regularly getting beaten up by her lovers. Or any permutation of the above. So the kids have a big problem and it isn't the kind that is necessarily solved by fining or jailing one or both parents for not sending the kids to school. In fact, criminal punishment could well make things worse. When I was a Deputy Public Prosecutor, I had sneak peeks into many lives of dark and quiet desperation. There are many people out there with huge personal problems, and some of them would end up in police files, and so I saw my fair share of them. Today, as I type this, I recall one particular case of mine that crossed my desk many years ago. The man had been arrested for drug trafficking, following a dramatic CNB raid on his HDB flat. He, like his lover, was a drug addict. The woman was pregnant. We had some suspicion that she too was a drug trafficker, but the evidence was too weak and so we proceeded on consumption and possession charges against her. As she was a repeat offender, she would be spending a long time in jail. Whatever happened to that baby? Did the woman eventually give birth in prison? Who looks after babies whose mothers are still convicts? And if the baby was born at all, was it born normal? Or was its health permanently damaged by its mother's heavy drug abuse? I don't know. I get sneak peeks, that is all, into these other lives. I read the police files, I appear in court, I prosecute my cases. Then I close the file and I move on with my own life, just as everyone else has to move on. Criminals and victims included. That baby, if it had been born and if it had survived, should be a 7-year-old child by now. Time for primary school. Dear baby, do you even know your mother's name?